The strong partnership between Augusto and Gaetano Pollastri (see part 1) led to a number of collaborative works and this, together with the fact that many of these and Gaetano’s own instruments have since acquired Augusto labels, has created considerable attribution difficulties. Yet there are some general features that help to distinguish their fine work. According to Cesare Pollastri, as a child in the early 1890s, having completed his own daily tasks, Augusto would silently observe Fiorini at work. At some point Fiorini discovered scrolls made from leftover wood hidden away by the boy and saw that these were rapidly improving. Fiorini later decided to teach him violin making more seriously. 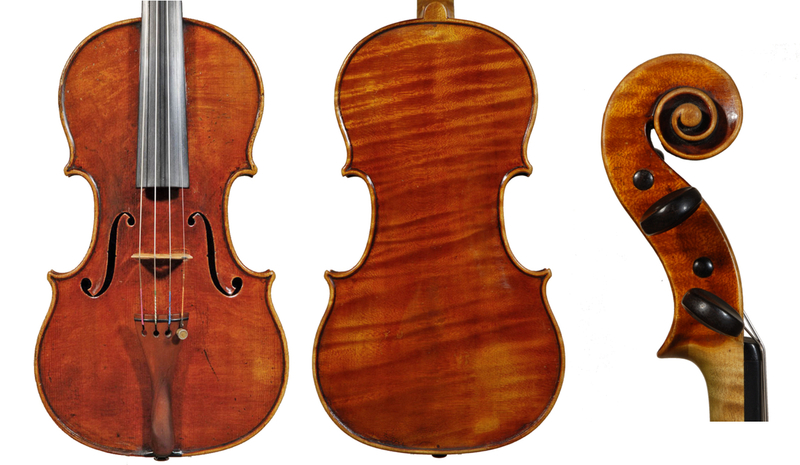 From the start of his violin making, Augusto’s work shows great ability and refinement. As with all Raffaele Fiorini’s followers (apart from his own son), Augusto always worked on the external form, and it is likely that some of Raffaele’s last instruments were completed by Augusto and his fellow employee Armando Monterumici. It is said that Augusto began building his own instruments only after Fiorini’s death; certainly his earliest and very rare instruments are very much inspired by his master. By 1906, having experimented for some time with various models (including, apparently, that of Pressenda), he had developed a distinctive model that differed quite substantially from that of Fiorini. However, during the first decade of the 20th century Augusto was mainly occupied with repairs and adjustments. One letter from his brother Gaetano to a trusted client in 1950 refers to Augusto having changed, back in 1906, a label of a Thir violin to that of Stainer – a common practice in those days. In this correspondence, Gaetano writes that he intends to correct his brother’s ‘misdemeanor’ by re-inserting the Thir label into that particular instrument. The precise source of the famous and elegant Pollastri model, which subsequently influenced such a large number of local luthiers, is unclear. It is, however, of interest that the influence of Stradivari’s golden period models, so prevalent outside Italy during the rise of modern Italian violin making, was generally disregarded by the Italians themselves. Perhaps the fact that Augusto adopted the beautifully ornate Santo Serafin label with its Latin script alludes to the type of violin making he most admired. As with Serafin, Augusto’s model was unlike any previously used and it comes across as a convincing synthesis of the best models of classical Italian violin making, without copying directly any particular craftsman of the past. Completely avoiding the Guarneri influence often quoted by Fiorini and Monterumici, the model shows much more of the refinement of Carlo Tononi and the Amatese Stradivari instruments, in particular in the strongly fluted, slightly shortened f-holes and their positioning, with the bottom circles very close to the edges. Compared with those of the Amatese Stradivaris, however, they slant a little more going into the top and bottom circles. The nicely rounded and delicately but deeply cut scrolls also recall those of Amati and Tononi. The elegant outline, which is enhanced by a slender waist, is somewhat square at the shoulders and lower bouts. The skilfully notched back buttons are rather tall and narrow, suggesting an oval shape; the light wooden back pins are quite large and removed from the dark, thick purfling, although this feature is more characteristic of Gaetano’s participation and many of Augusto’s works, presumably made without Gaetano’s involvement, are entirely without pins or have smaller pins positioned close to the purfling. The edge is extremely distinctive: in earlier examples it is only delicately raised, whereas in the instruments from his last two years it becomes quite woody and more deeply cut, with the purfling sitting deep inside the almost ropey edgework; the latter characteristics pointing to some collaboration from Gaetano. Augusto’s earlier instruments, though carefully finished, are not technically perfect, but by the 1910s they acquire an impeccable level of workmanship. However, something indefinable distinguishes his best works: perhaps the refreshing spontaneity of his model’s design without any sign of the quirky technical deficiencies associated with many other Italian makers of his era. His model’s perfectly balanced proportions, plus his thick, soft, generally oil-based varnishes of an attractive reddish-brown or deep orange color (applied on to a golden ground after the fingerboard had already been glued on), make his best instruments irresistible to aficionados of fine lutherie. The wood choice is invariably of the highest order with many one-piece backs of both quarter-cut and slab-cut maple. Augusto shunned the cheaper poplar or local maple often used by his predecessors and contemporaries, as well as the oppio maple historically often used by makers working near the Po valley. Once established, Augusto never veered away from this basic model, variations of which found its way into the work of most of the succeeding makers of the modern Bolognese school. For example, the most important follower of the Pollastris, Marco Dobretsovich, despite having created his own model while in Cairo, was only successful when using that of Pollastri. Apart from their generally highly attractive appearance, Dobretsovich’s Pollastri-modeled instruments have a reputation for tonal excellence. They were already praised by such musicians as Jascha Heifetz, Jan Kubelík and Bronislaw Huberman during the maker’s lifetime. In 1938 a splendid quartet of Dobretsovich’s instruments was presented to King Farouk I of Egypt, who was a leading patron of the arts and a keen musician. This may well explain Dobretsovich’s strong connection to Egypt. Despite it being a seemingly unlikely location for a fine violin maker, he was able to sustain an abundant production of high quality with a significant customer base. Augusto was a fine restorer and dealt in antique instruments, which perhaps explains why his own making was so limited in output: according to Cesare, only 64 instruments (54 violins, 5 violas and 5 cellos) are correctly attributed to his hand. Gaetano likely repeated this operation on a number of occasions, catering to the requests of certain clients. It was quite an accepted practice in Italy for a pupil or direct descendant of a maker to copy and label instruments with the labels (often original) of their teacher or ancestor without compromising their own integrity. Gaetano himself was, however, critical of fellow makers who ‘faked’ or imitated the styles of other makers with whom they had little stylistic or chronological connection, while antiquing their work in order to pass it off as older originals. 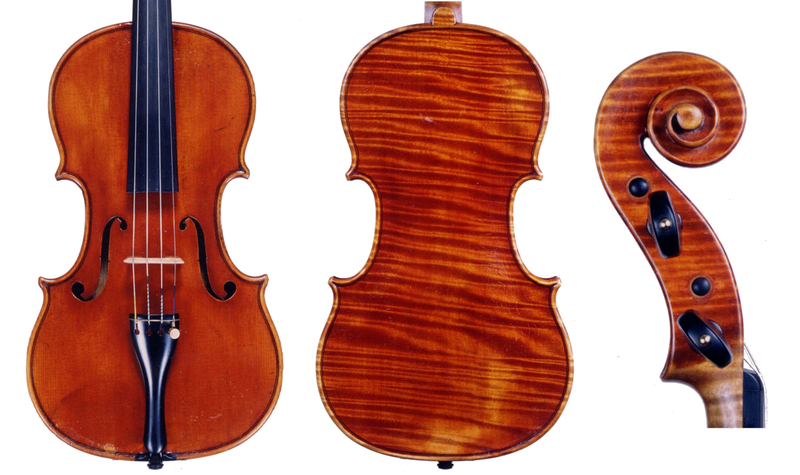 Though initially Gaetano’s instruments remained very similar to those of his brother, gradually his mostly spirit-based varnishes began to lose the appeal of his brother’s more beautiful oil-based ones; having lost the intensity of color one sees in Pollastris of the 1910s and 20s, Gaetano’s reddish-brown to orange-brown instruments, acquired the more ordinary type of appearance common to many of his excellent Italian contemporaries. Throughout much of the 1930s Gaetano’s instruments remain consistently excellent. Some of the splendidly flamed, quarter-cut maple backs are missing the more commonly used, large pins. By the late 1930s Gaetano’s instruments had become quite easily distinguishable from those of Augusto in which he may have had a hand, although they are still of excellent quality. Fine details showing Augusto’s touch, such as the well thought-out and decisive carving of the edges, corners and flutings of both body and scroll, were lost as an impatience began to pervade Gaetano’s later work. He appears to have succumbed to a call for faster production, a trend associated with many of the best makers of those years due to increased demand. The channeling became shallower and the corners somewhat more narrow and elongated. During the 1940s Gaetano’s instruments lighten in color, with more orange-yellow varnishes appearing, and the hands of his pupils become evident in some of his instruments. By the 1950s some instruments even acquire a rather pale, almost greenish tint. Gaetano used his own printed label from 1927–34, the brothers’ handwritten coat-of-arms label after 1935, and the same rooster brand used by Augusto throughout his career, although on the lower rib and underneath the varnish the brand normally appears fainter and its filler, if any, is lighter than that of Augusto. He completed around 165 instruments, including several fine copies of inlaid Stradivari violins and a few cellos and violas. Apparently, false Pollastri labels began to circulate even during Gaetano’s lifetime, with many clever Italian copies hitting the market from the mid- to late-1980s. With thanks to Roberto Regazzi. Dmitry Gindin is an expert, consultant and author of The Late Cremonese Violin Makers. The articles in this series are adopted from his forthcoming book on a selection of the greatest modern Italian violin makers, featuring high-quality photographs of iconic and interesting examples.